The Rangers' Alex Rios, 33, is seeing slightly more pitches per plate appearance, helping him bounce back the past two seasons. During a conversation with Alex Rios about the changes he’s made over his career, the Texas Rangers outfielder made a comment about an accepted truth in baseball. His comment was seemingly simple but hid one of the more complicated aspects of the game. We were talking about his bad year in Chicago in 2011, when he hit .227 with 13 homers and 11 stolen bases, and his wRC+ was 40 percent below the league average (Rios’ FanGraphs player page). When pushed to come up with a reason for his renaissance since that low, Rios could only think of one thing he’d really changed. "I was trying to get deeper into the count and see more pitches and be a little more patient at the plate, to make myself hit a better pitch," he said of 2012, when his career got back on track. Rios did take more pitches per plate appearance in 2012 than he did in 2011 — .05 pitch more per plate appearance, or about 30 more pitches over the course of a full season. Not a ton more pitches, but more. And it’s a trend he’s continued since, to the point that he’s now back above league average in the stat (3.85). To some extent, this trend is natural. Below is an aging curve created by Jeff Zimmerman (using this methodology) to show how pitches per plate appearance age for your typical batter. Basically, the y axis shows the difference in pitches per plate appearance off the peak number. Looks like batters generally learn to take more pitches as they age. 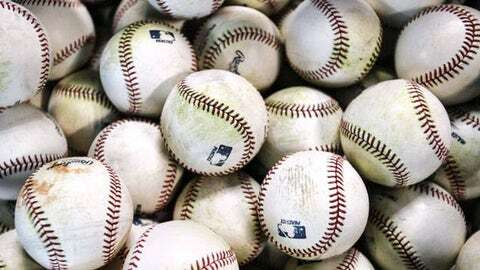 Seeing more pitches may be a learned skill and is an oft-recommended approach in baseball, but it isn’t without some pitfalls. Take strike one, for example. That’s an easy way to see more pitches, but the first-pitch strike rate is up across baseball, so you might fall behind right off the bat. And if you become predictable in taking the pitch, you can fall into the problems that Pablo Sandoval is seeing this year. He’s taking the first pitch twice as often as he has in the past, and it’s just leading to more 0-1 counts — and the league hits .219 with a 28.5 percent strikeout rate after an 0-1 count. The league hits .264 with a 16 percent strikeout rate after a 1-0 count. Take a pitch, sure, but make sure it’s not a strike, especially if it’s the first one. And that’s the key, really. Taking more pitches isn’t going to be great if you’re taking strikes. 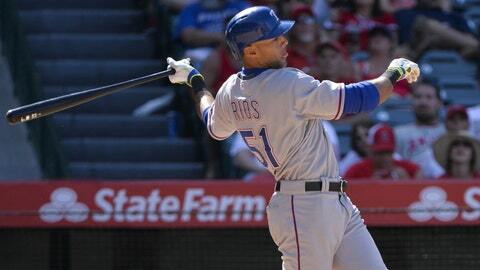 Rios is a five-tool guy, but plate discipline hasn’t been his best asset. His reach rates have been worse than league average for most of his career, and his walk rate is about half the league average — and has only improved marginally since he started taking more pitches. Take a look at the table below. It lists the correlations between pitches per plate appearance and different offensive metrics at our disposal. It’s ranked by strength so that you can basically see what taking more pitches per plate appearance will do for you, relatively. I used this great tool to run the correlations. Of course, the strongest effect will be on your walk rate. Raw pitches per plate appearance tells you a good deal about a player’s walk rate, actually. And so, therefore, taking more pitches is good for your on-base percentage. Not surprising. 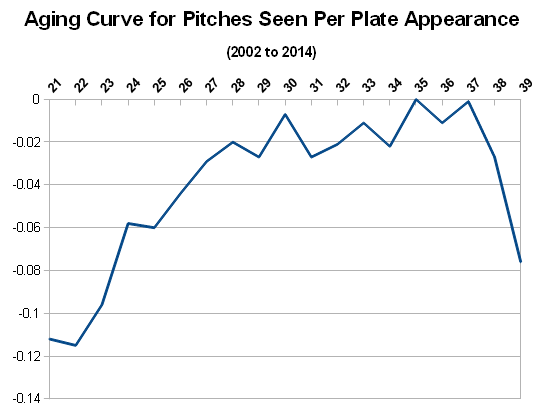 Perhaps surprising is that more pitches means more strikeouts about as often. Taken all together, though, the added power and patience outweigh the strikeouts: More pitches lead to better weighted offensive numbers overall (wOBA). Rios talked about staying consistent at the plate and what it’s like for a five-tooler to work on his game. — "You focus on your offense more than anything," he said. Rios talked about running more. — "It’s part of my game, and I can still take advantage of it and I’m going to keep doing it." He talked about making more contact. — "I don’t think there’s an approach you can take to make more contact; it just happens.". But it was that one comment about taking more pitches that uncovered a rabbit hole within the game. 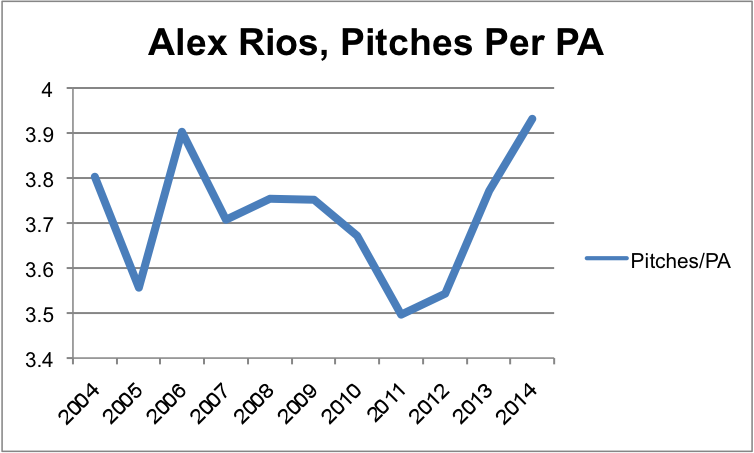 One day, after a year in which he saw the fewest pitches per plate appearance of his career, Rios decided to see more pitches. That was only natural, and it may have led to more strikeouts since, but it’s helped his game overall.